Upper Dolpo trekking is remote hidden trekking destination in Nepal where Nepal's most tranquil and natural beauty is still unexplored. 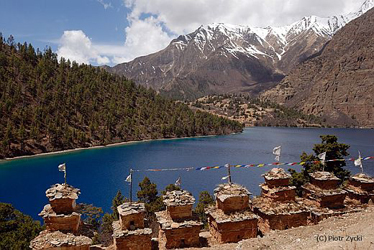 In the far reaches of Northwestern Nepal lies the extreme landscape of Upper Dolpo. The route begins by meandering through pine and cedar forest with views of the massive Dhaualgiri range in the background. The entrance to Dolpo lies beyond the Jangla Bhanjyang Pass, (4500m). At the head of the valley lay snow-capped peaks and the desolate Tibetan plateau beyond. Protected from rain, this region is dry where the Dolpo inhabitants have carved out a niche of survival in the harsh surroundings by trading with nearby Tibet. A vision of beauty, the Phokshindo (Ringmo) and the legendary monastery of the pre-Buddhist Bonpo sect is our momentous destination. As the most remote and least developed district in Nepal, this trek is reserved for those with a true sense of adventure. Our airport representative will be receiving you at Tribhuvan International airport, Kathmandu and s/he will be displaying your name signboard outside the airport terminal. You will be then transffered to your respective hotel in our private tourist vehicle. Overnight at Hotel. In the morning, after breakfast, At around 8am, we host a pre-trip meeting at your hotel or at our office in Kathmandu and introduce your trek leader/guide. Please seek this opportunity to ask questions about your trek. After the meeting and a hearty breakfast, your sightseeing trip will start at around 9:45am. You will have a private vehicle and a professional tour guide at your disposal. The rest of our time in Kathmandu is free for further exploration and some last-minute shopping in Thamel area near by your hotel. Overnight at a hotel. Fly to Nepalganj from Kathmandu- 1 hr Flight. Price includes: Airport Pick up/drop, accommodation in kathmandu at tourist standard hotel, all inclusive trek such as Ground transportation, necessary permits ( including special permit), entrance fees, professional guide, porter/porters, and their expenses including their insurance and equipments, accommodation in the tent ( Mattress, sleeping bags) or at guest houses/home stays, all food (breakfast, lunch & dinner) with tea/coffee, soft drinks, all domestic flights etc.